Lemon and bergamot oils from southern Italy. In the little-known province of Italy called Molise (near the ankle of Italy’s boot), Marina Colonna presses great olive oil on her family’s estate. She makes a few bottles of oil pressed with citrus fruits, too, which we’re offering here. It's important to note these are not scented or flavored with essences like most flavored olive oils. Marina presses her olives right along with the fruit peels, all of which are hand peeled from organic citrus. In case you're thinking about getting into this business, I asked how much work it takes to hand peel citrus for olive oil. Marina says, "Six women. Full time." These are delightful oils when you are cooking in warmer weather—or when you want to be reminded of it. The lemon oil is the most well known and thus most popular. However, I’m quite fond of the oil pressed with bergamot. It's a small, fragrant fruit that grows in Southern Italy, the prime ingredient in Earl Grey tea and smells like a citrus grove on a sultry late evening. Use these oils on grilled vegetables or fish, salads or roasted chicken. A great way to add easy excitement and flavor to your cooking. 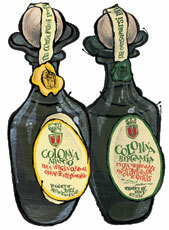 "Colonna Bergamot oil has a clean, crisp citrus note but without the sharper edges of lemons and oranges. It's wonderful on broiled/grilled fish, added to roasted vegetables, tossed with fresh salad greens or mixed into pasta dishes. My favorite . . . as a dipping oil with warm bread."